PAN AM started life in 1927 as Pan American Airways flying air mail. Flying boats were used to link the US with South America and then over the Pacific and Atlantic oceans using Martin 130 and Boeing 314 flying boats. Douglas DC-6Bs, DC-7s and Boeing 377 Stratocruisers were used on the post-war London Heathrow services. These were replaced in 1958 when Pan American World Airways took delivery of the new Boeing 707-120 long-range jets. These proved inadequate to long-haul flights and were quickly replaced by 707-320Cs and DC8-30s. 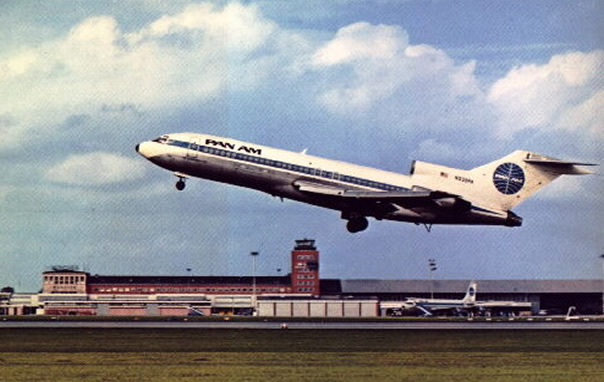 In 1967 Boeing 727-100s were introduced and later used on the London-Germany route. A large fleet of Boeing 747s were introduced by the 1970s, the first flight into Heathrow by PAN AM 'Jumbo' happening on 22 January 1970. The late 1970s saw the Boeing 737 on the London route along with L1011 Tristars and 727-200ADVs. DC10-10s from the US carrier, National Airlines were used mainly on charter flights into London Gatwick. Airbus A310s were used between Heathrow and the US mainland during the mid/late 1980s. 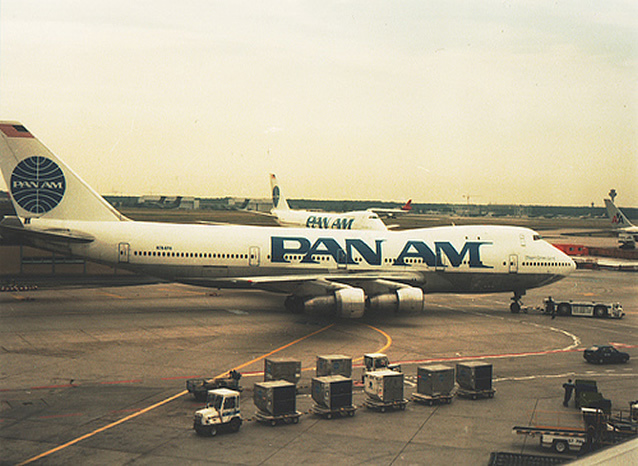 In the early 1980s a new livery was introduced with a large PAN AM title across the side of the aircraft. Some 747s also experimented with the old cheatline but the cheatline was finally lost with the A310 aircraft having an all white fusalage. The age-old PAN AM globe logo was kept on the fin throughout it's history and was enlarged with the new livery. 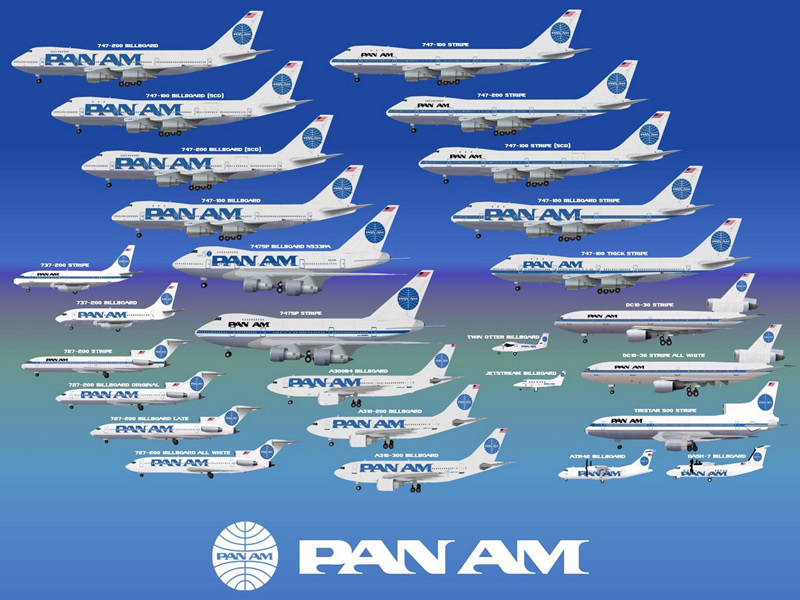 Toward the end of it's existence PAN AM tried several different liveries, mainly on their 747 fleet, standardizing on one with a huge PAN AM title with no cheatline and a larger PAN AM globe logo on the fin. In 1991 the airline went into liquidation after years of financial problems and it's Heathrow routes were aquired by United Airlines and Delta Airlines ending an era at Heathrow as Pan American were at Heathrow at it's opening after the war. 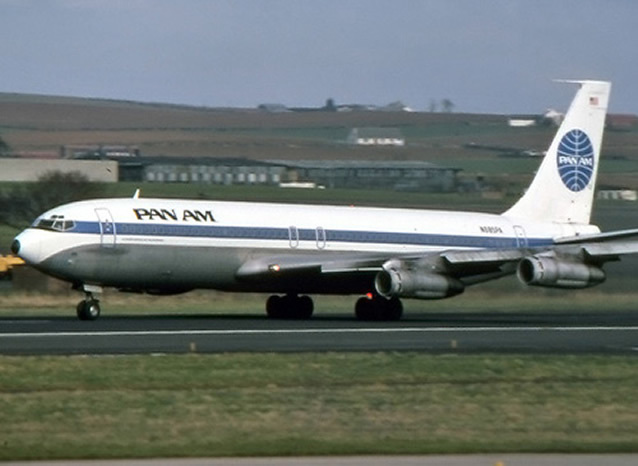 PAN AM restarted operations but that failed. A third airline using the PAN AM logo and identity is now about to start flights using Boeing 727-200 jets with winglets. PAN AM has been one of the world's great airlines.